When it comes to preparing and cooking vegetables, you should rinse them under running water; scrub tough skinned veggies with a vegetable brush. Trim sparingly: the green outer leaves of cabbage, for example, are high in food value, and unless they are tough or wilted, these leaves are well worth eating. Peel thinly if you feel it’s necessary, or consider leaving the skins on some veggies, such as potatoes. Nutrients are directly beneath the skin and the peels are a good source of fiber and also contain vitamins and minerals. Tip: I don’t peel carrots or potatoes. Scrub them with a vegetable brush thoroughly and that’s all it takes. 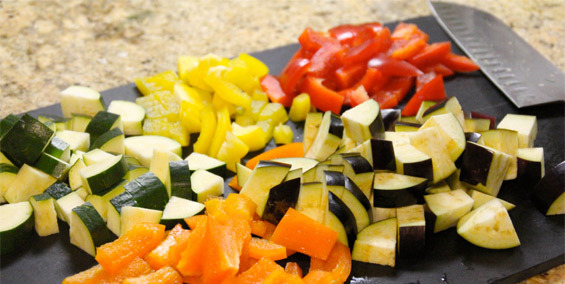 Avoid soaking sliced, chopped or peeled vegetables; soaking leaches out minerals and water-soluble vitamins, especially if the pieces are small. Also, try not to leave the vegetables exposed to air and light. Cook them as soon as you can. Generally speaking, vegetables need to be cooked only until they are tender but still slightly crisp. The most misunderstood cooking method, unfortunately, is the one most commonly used: boiling. When a lot of water is used and the process is prolonged, boiling can destroy as much as 80% of the vitamin C, and cook and leach out other vitamins and minerals as well. Too many well-meaning cooks throw away far more nourishment than they realize when they pour the cooking water down the drain. For example: an experiment proved that water in which cabbage was cooked contained more B vitamins than the vegetable itself.